Father Francis Eckstein grew up across the road from St. Nicholas Parish, a small country parish in the hills of Ripley County in southeastern Indiana. When he was ordained a priest 50 years ago on May 3, 1958, he had hopes that he might one day be the kind of pastor of a country parish that he had admired as a boy. But for nearly 40 years after his ordination, Father Eckstein didn’t see much of the countryside, ministering instead in Indianapolis and in mid-sized cities and towns, such as Richmond, Connersville and Bedford. 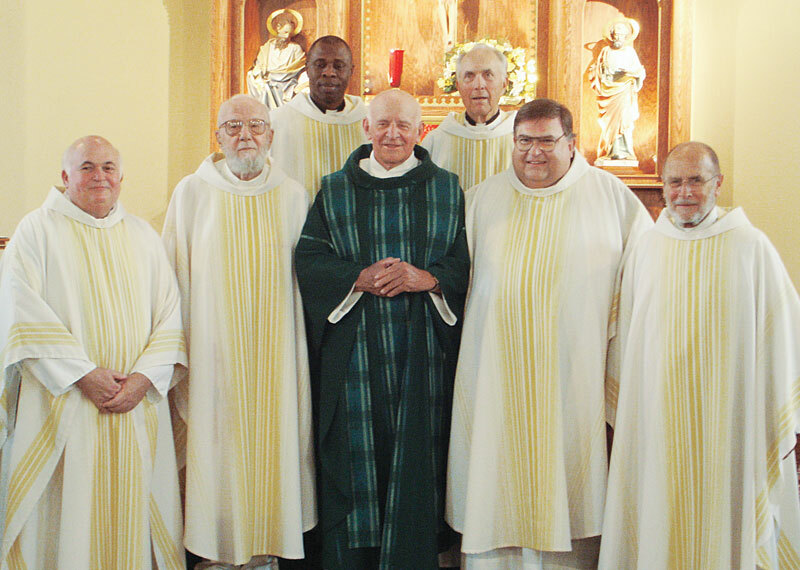 His dream wasn’t fulfilled until he was given his last pastoral assignment before he retired when, in 1995, he was named the pastor of St. John the Baptist Parish in Osgood and St. Mary Magdalen Parish in New Marion, both in the Batesville Deanery. Now, in retirement, he provides sacramental assistance to St. Charles Borromeo Parish in Milan and St. Pius Parish in Ripley County. He lives at St. Charles Parish, just miles away from his old family home. Although it took a long time for his country parish dream to become a reality, Father Eckstein accepted in humility wherever he was assigned. 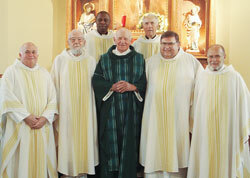 “He was always willing to go where the archbishop asked him to go,” said Msgr. Harold Knueven, one of Father Eckstein’s ordination classmates, who grew up less than 10 miles away from him in New Alsace. Eleanor Oberle, a member of Holy Family Parish in Richmond, got to know Father Eckstein in 1960 when the priest was an assistant pastor there. Father Eckstein grew up the middle child in a family of five boys and four girls. According to Verena Federle, a younger sister, Father Eckstein always took the lead when he and his siblings would play Mass in their family’s farmhouse. His parish priests often encouraged him and the other young boys at St. Nicholas to consider becoming a priest, especially, he said, when they would come to the parish’s two-room schoolhouse in the 1940s to pass out report cards. Father Eckstein eventually entered Saint Meinrad Seminary in 1946. Although it took decades for him to return to his southeastern Indiana roots, Father Eckstein still sought to “mingle well” with the people he ministered to wherever he found himself. He always looked to parishioners first for the priorities in his ministry. Oberle has seen this quality in her friend for nearly 50 years. What Father Eckstein has learned in giving himself to fulfilling the needs of those he serves is that, in the end, he finds fulfillment as well. It is something he said is good for young men today who might be thinking that God is calling them to the priesthood. “It’s a very fulfilling and satisfying kind of life,” said Father Eckstein. “You’re really touching people’s lives in good times and in bad.